Whimsey is my "trash faerie"...so here's her story. I was walking downtown in my wee city of Niles, and I saw bits of stuff hidden in the corners. So, I thought, "Why don't faeries live in cities too? So I added a Coke can, empty bottles, snails, and anything else we all live with. Hey, it was a dull day ;) She is signed and numbered Limited Edition. Edition of 500. Open Edition. Elemental series includes: Ember - The Fire Sprite, Terra - Daughter of Gaia, Maia - Spirit of the Waters, and Aria - Child of Air. Signed and numbered Limited Edition. Edition of 1000. Come enter the realm of the fey people! 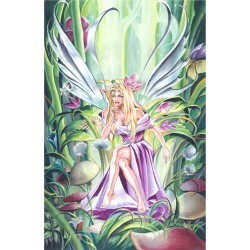 The rich, vibrant colors of Ruth's faeries will tease and delight you with their bewitching smiles. Come enter their enhanted forests, but beware of their midnight dances for their abductions are done silently and unawares to men. "Under the Bed Fairy" is a limited-edition, signed & numbered print of 500, matted to 11" X 14" the perfect size for ready-made frames. She's hiding under the bed with all the dust bunny monsters for companions! This is my first series of Faeries. They include Titania, Oberon's Mistress, Puck's Delight, and A Midwinter's Dream. I think they were a ton of fun to paint! 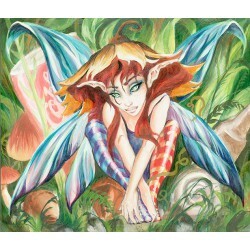 This is my second series of Faeries. They include Terra, Aria, Ember and Maia. You can tell that I was really into gardening during these paintings, look at all the plants from my own garden! Final matted size is 10.75" X 19.50"
"Once Upon A Time" is the finished triptych of my Fables Series. These include "Mirror, Mirror", "Sinderella", and "Puss 'n Boots". 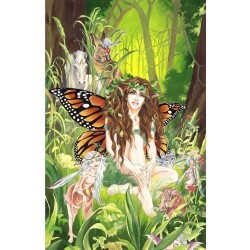 There are so many Faerie Tales in this piece... But, can you find the hidden 10th one? (Look on the Little Bear's pyjamas...you'll see Little Bo Peep and her Sheep romping all over them!) These are the Faerie Godmothers of the main tales, Snow White, Cinderella and Sleeping Beauty, my way! Elemental series includes: Ember - The Fire Sprite, Terra - Daughter of Gaia, Maia - Spirit of the Waters, and Aria - Child of Air. This is the precursor to my Faerie Zodiac. Gemini Mischief has two of the same faerie but from different sides of their personalities. I love the colors I added here and if you look closely, you'll see tiny versions of my Ember and Puss in Boots Faeries. The Faerie Witch of Cats is the newest piece in my Faerie series. The others in the series I'm working on are a Faerie Witch of Dogs, Pocket Pets (ferrets, hamsters, rabbits, and other small critters), Birds, Horses & Fish too! I have crammed 30 cats into this piece, including my own. The grey tabby sprawled on her foot is my eleven-year old baby, Ari. He's soooo spoiled! Even bunnies have a tooth fairy! bunnies have a tooth fairy! Okay, so I have fun with some of my faeries, and I do love bunnies. If you look closely, you'll see a bunny tooth in her hand. Signed and numbered limited edition of 1000. My Elemental Faerie series includes: Ember - The Fire Sprite, Terra - Daughter of Gaia, Maia - Spirit of the Waters, and Aria - Child of Air. I really like to add critters to my faeries, can you tell?